You have to understand what the people who use your digital services need to do before you can make tools to help them. Read on for a description of what user needs look like, how to collect and analyze them, and how to put your findings into practice to provide better digital services. A resident, constituent or citizen—but more specifically, someone who interacts with the public service your government delivers. An articulation of what your users are trying to accomplish or achieve—which can be fundamental (“get the medicine prescriptions I need”), general to your service (“enroll in Medicaid”), or specific to a task (“intuitively describe my income”). A user need is a well-defined statement of what your service or program empowers people to do. User needs are a framework for understanding both the big picture needs (the reason your service exists!) and the implementation details of how people can successfully use your service. They form the boundaries of what your service or program does and doesn’t do. Explicit user needs will help your team develop a shared understanding of the context people carry as they try to use your service. These details help policymakers and service delivery teams make good decisions and wise tradeoffs. Without a good understanding of user needs, each decision has a much higher risk that it will result in wasted time, money, or good will. We can’t assume to know what our users need. After all, people are complicated! Technology is complicated. And how people use technology changes all the time. While users might be complicated, discovering their needs is not. Every user need begins as a hypothesis—an attempt to describe the context our users carry with them. Through user research and a close look at user behavior, we can determine if our hypothesis holds, or if we need to revise it. But before you can test a hypothesis, you need to state it clearly. User needs are typically articulated through user stories. These user stories are vignettes that describe a situation, motivation and expected outcome as seen from the perspective from your constituent. General user stories often encompass many specific ones, each reflecting a user need. Always be talking to users. User research is a critical part of developing a successful service or program. Understanding your users deserves your team’s time and investment. Ideally, you’ll have team members dedicated to understanding and advocating for your users. If you are short on time or resources, you can still do user research. 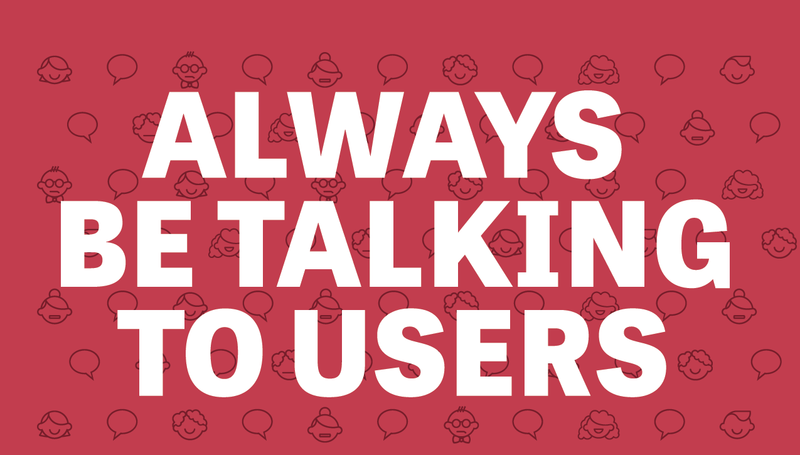 Whether you are a manager, an engineer, or analyst—you can talk to users. In fact, you should always be talking to users. Talking to even five or six users will gain you insights that will help you serve all of them. When in doubt about how to start, there is one thing you can always do: customer service. Handle paper applications at the counter. Do a ride along. Take phone calls. Manually help people succeed in using your service. When you do customer service, something magic happens. You get to know people. Suddenly, your users’ problems become your problems. The more time you spend with your users, the more intuition you'll build about how to address their needs. When ________ / I want to ________ / so I can ________. When our understanding of user needs keeps getting better, our service keeps getting better too. Once you have articulated user stories, you can begin to gather data that will support your hypotheses, or lead you to revise them. Data helps us evaluate both how well we understand and how well we address user needs. To gather the data we need, we constantly conduct user research. User research basically boils down to asking users questions and watching what they do. We can ask questions during in-person interviews, in phone conversations, or through surveys. We can watch user behavior during live usability studies, or looking at the data generated by website analytics—seeing what kind of device they use, how long they spend on your site, or where they fail to take the next step. This is how we collect the data—qualitative and quantitative—that helps us better understand user needs and how to serve them. This is how we know to change our the tone of our copywriting, to re-arrange orders of operations, or to focus on giving users one special tool instead of many general ones. This is the work that leads to key advances in our service. Document How it Works Today: In government, we are almost always working with existing public services or programs. So the first question is, how does it work today? Actually go through the service yourself, and document it thoroughly. Give people at the top of your organization the ability to see your service from the ground-floor. Go Observe Real Users: Documenting an existing service isn’t just about screenshots though. Go observe people filling out forms, submitting paperwork, and trying to navigate the service online or in the office. You’ll learn a whole new level of detail—including the emotional states of your users, the tools they rely on, and the time constraints the operate within. Recruit Users for Interviews: Interviews are a great way to discover user needs. They offer a chance to explore why people behave or think in a specific way. Key questions drafted and tested in advance serve as the foundation for rich conversations that can uncover surprising information and useful details. Get Users on the Phone: You don’t need to leave the office to interview users. After someone uses your service or program, recruit them to talk about their experience while it’s fresh. Routinely taking 10 minutes to talk to users can help you uncover important edge cases much faster. Ask for Feedback: Short feedback forms (1 to 3 questions) answered right after a transaction can be an effective way to evaluate how well your product or service meets core user needs. Frameworks like the “Net Promoter Score” can help you measure overall user satisfaction. Distribute Surveys Online: It’s never been easier to create and distribute surveys. Surveys are a great way to learn about the needs of potential users, and to get a mix of qualitative and quantitative user feedback. Surveys can be especially helpful for reaching specific groups of people, whether they be citizen groups or staff in other departments. Survey Users via Text Message: Text messages are a comfortable way for users to answer questions without interrupting their daily business. Moreover, surveys sent over SMS enjoy high response rates. Keep it short brief though—your questions should be easy to answer and require little typing (think YES or NO). Organize a Usability Study: Usability studies are a key way to evaluate how well you are meeting user needs in your website or mobile application. Organize a usability study so you can watch people navigate your service hand. Notice what comes intuitively, and what causes users confusion or delay. Documentation: Check out UserOnboard.com to see great examples of how to document existing services. CitizenOnboard.com includes examples of government services. Recruiting: Check out Ethn.io and similar tools they help you recruit users for interviews on the phone and in-person. Web Surveys: Check out free tools like Google Forms and SurveyMonkey make survey data collection and analysis easy. SMS Surveys: Check out tools like Textit.in to create short, plain language SMS surveys that enjoy high response rates. Don’t overthink it. The more you talk to users, the faster you will learn how to get the most out of each interaction. Reward participation. The time your users give is worth it. Be sure to compensate participants for their time. Don’t ask leading questions. When interviewing someone, try not to bias their responses with affirmation or strong responses. When in doubt, just keep them talking. Encourage stories and description. When people tell stories, they’ll include details that were important to them that you might never have thought to ask about. Document your work. The impact of your research is a function of how well you can share the insights you gain. Analyze your data, write a summary, and help people drill deeper into your work. Conversion rates. What percentage of your users complete the entire task at hand? Device Type & Browser Type. What technologies are used to access your service?